Time to switch gears (har har). For the past few entries we’ve covered the blindingly rapid (and stupidly expensive and wasteful) turnover on my side of the garage from 2011 to 2012. It is interesting to note that I was having a similarly rapid evolution career wise. Having left Microsoft in 2010 after a full decade, I had decided to “sleep with the enemy” and join the VMware ecosystem as a Principal Architect on the Service Provider team at VCE (Acadia when I joined). I spent a year and a half at VCE configuring and selling Vblocks and made fantastic friends who were both an honor and a privilege to work with. Those were some crazy days filled with learning new things (refreshing after so many years of iterative evolution at Microsoft) and super hard work (our then boss, now CTO Trey was fond of saying we were “building the airplane while flying it”) One year ago though, a good friend of mine who was a GM at Amazon at the time, reached out and asked if I would be interested in joining Amazon Web Services as an inaugural member of their newly formed professional services team. I am bullish on public cloud, and feel it is important to be on the front lines of helping shape this latest transformation of our industry, so I jumped at the chance even though professional services was a career path I had diverged from quite some time ago. Maybe there is some psychological root cause behind all of this churn? Searching for lost youth? Midlife crisis? Who knows. All I know is that it has been great experiencing all of these cars and it was nice to start switching up the career again after such a long stretch at one organization, so I am just enjoying the ride! 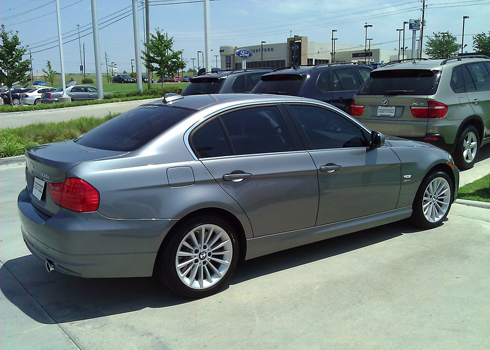 2011 335xi drive in space grey over black with premium, nav and cold weather. Pretty much a perfect build out and a classic BMW color combo. She stickered at $52k and we negotiated down to $47k at which point we worked up a lease featuring a great “BMW loyalty” money factor. The 335 actually ended up one of the better lease deals I’ve ever owned and one of the rare times I felt good financially leaving a dealer. I had figured that the 335xi coming out would be pretty much an incremental improvement over the 330xi going in. Fifty feet out of the dealer lot I realized just how wrong I was! In this category we did indeed find those incremental type improvements we had been expecting. Nothing was really dramatically different here, which is a positive thing. Quality seemed about the same, maybe slightly better in places, and the general design of the cabin and layout of the controls was the same as well. So far so good since familiar is what the wife needed. Outside as well, the 335 wasn’t breaking any new ground. It was slightly tweaked from the 330, but nothing a non-purist would pick up on. Even the F30, it should be said, isn’t really significantly different from any of the E90s. At this point BMW seems to be erring on the side of refinement and evolution and is perhaps saving a radical transformation for a less risky space than the 3 series (like possible the 1 series or a new line altogether), or is holding off until they feel the industry is pulling up next to them. As it stands now, to my eye, the E90-esque 3 is still one of the nicest compact sedans on the road. I find it’s styling to be superior to the somewhat too busy Mercedes C and the too bland for my taste Lexus and Infiniti, so I think BMW is playing the right hand here. One thing I had missed, but my wife immediately noticed is that the 2011 335xi is just slightly (and I mean slightly) larger than the 330xi (181.1 inches long vs 181.9) I should either be happy, or worried, at her near supernatural ability to perceive minor size differences like this. The jury is still out on that one! Overall it can be said that the last of the E90s is very familiar territory for anyone familiar with the first of them; refinement, not revolution. Ah… here now, we have transformational change. The 2011 335 is not only on an entirely different playing field from the 2006 330xi, but in my opinion it is no exaggeration to say it is on an entirely different playing field from nearly any other current forced induction car. By 2011, BMW had had 4 years or so to work on perfecting their tuning of the turbo charged V6 configuration for the 335. Their obsession had paid off in spades. I have never experienced a turbo charged car as lag free as the 335. The turbo is so well tuned for the street that, paired with the 5 speed automatic, it feels like you are driving a big torque normally aspirated engine. Factor in the AWD of the X drive model and the car is a rocket off the stop light. Light goes green. Hit go pedal. Car takes off with no drama. Not since the 545i had I felt anything like that and I realized I really did miss the combination of a powerful engine matched to a well tuned auto. Even the GTR, as monstrous as it was and as perfect as its dual clutch has been tuned, was never so consistent and predictable off the line as the 335xi. The changes didn’t stop there either. Once moving it became evident that the continual tweaks BMW had been doing to the tire composition provided by their supplier and the suspension geometry had paid off as well. Where the 330xi provided minimal body roll, tight handling and a firm ride that was a bit punishing on poor road surfaces with occasional worrisome and unhealthy sounding impacts, the 335xi provided even better handling characteristics but coupled with a ride that somehow managed to be pliant and comfortable, insulating you from poor roads in the best tradition of European sport sedans. The steering weight was absolutely perfect and communicative without being intrusive or taking the risk of distracting a less experienced driver (it’s a 3 series after all, not a 911 or an M3). Throttle response was fantastic; as mentioned especially so for a drive by wire turbo. Braking felt superior as well, with excellent pedal feel, minimal fade and short stopping distances befitting the more powerful package. No issues at all. We never even made it to the first service, oddly enough, but that is a tale for the final entry. I actually did end up modding the 335, mainly out of curiosity. It turns out our local BMW dealer, the wonderful Daniels BMW, is an official Dinan dealer. Learning that their ECU update was a software only upgrade much like working with a Cobb or Tactrix, I had to give it a try. I called up, brought the car in the same day, and rolled out with a stage 2 ECU flash. It was on sale for $1700 so I couldn’t resist. If the stock 335xi was a wonder, the Dinan stage 2 made it a monster. Essentially, the Dinan stage 2 was like an automatic, 4 door AWD M3. Not quite as quick as an actual M3 sedan, although certainly inline with the porky M3 convertible, yet with all of the versatility of AWD. Other than the noticeably increased power and straight line performance, the Dinan stage 2 was invisible. Fantastic software and, as far as I’m concerned, highly recommended! So once again, how is it possible that a Dinan stage 2 335xi is no longer occupying a garage bay? Once again, this is my wifes car and with all of the insanity I’ve gotten away with it’s only fair that she be allowed her moments of craziness as well. Also, with the kid now being 6 years old and having opinions, she weighs in as well. Suffice it to say they both found something they preferred and, since it’s her car, my beloved 335xi went back in mid-lease. I’ll talk about that process, including numbers, in the last entry.